The Badger is the largest Irish member of the mustelid or weasel family and is one of our most distinctive mammals. Its stocky body, short, powerful limbs and striking black-and-white head markings make the badger unmistakeable. Adult badgers are typically 65-80 cm (25-32 inches) long and weigh between 8 and 12 kilos (17 and 27 pound). Badgers are found throughout Ireland, although because they are primarily active at night they are rarely seen. They live in family groups or clans of up to twelve individuals that occupy a large network of underground tunnels and chambers known as a sett. Badgers are clean animals: they regularly change the bedding in their sleeping chambers and have been observed bringing bedding to the surface to “air” before taking it back underground again. At dusk the clan will emerge from the sett to forage over a shared territory of between 125 and 375 acres. They are true omnivores and will eat a huge variety of food including invertebrates, small mammals, amphibians, reptiles, carrion, vegetables, fruit and even cereals. Their favourite food, however, is earthworms, and a badger can devour up to 200 of them in a single night. In common with other mustelids, badgers mark out their territory and communicate using scent. 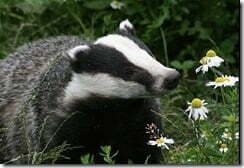 Each badger produces a characteristic musky scent from special glands, and as well as marking territory this scent serves to identify the individual badger and to maintain the social harmony within the clan. Badgers exhibit a breeding phenomenon called delayed implantation which allows mating to take place at any time of the year. The fertilised eggs are then stored in the uterus in a state of suspended development until external conditions are favourable, when they are implanted into the uterine wall and, after a further gestation period of 7-8 weeks a litter of between one and six cubs will be born. Cub mortality is high, and only about half of the cubs born will survive to adulthood. Even with no natural predators badgers that reach adulthood face an uncertain future. Many badgers die every year on our roads, and thousands more are illegally snared and shot. Despite being protected under both The Irish Wildlife Act 1976, 2000 and under The Convention on the Conservation of European Wildlife and Natural Habitats (The Bern Convention), to which Ireland is a signatory, the badger population in Ireland is under siege. More than 25,000 Irish badgers have been legally culled over the last fifteen years or so in an ongoing government scheme to try and control the spread of Bovine Tuberculosis in cattle. Bovine tuberculosis is a disease of cattle that has spread into the wild badger population, and not the other way around. The link between badgers and increased incidence of bovine TB is far from conclusive, and yet badgers are routinely persecuted in an attempt to control the disease. The effectiveness of Ireland’s extensive badger culling programme is questionable at best, and is widely acknowledged to be unsustainable in the long term. Let’s hope that an alternative strategy can be found to control bovine TB – perhaps one that concentrates on the main carriers and transmitters of the disease, cattle – before we deplete our wild badger population to the point of no return.